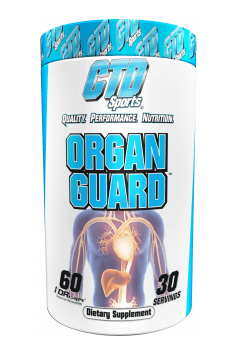 CTD Sports Organ Guard is a new version of Liver Armor which supports normal functioning of the heart and liver and promotes arterial health. The supplement can be used by individuals taking anabolic-androgenic steroids (AAS) or anabolic substances which may have a negative impact on cardiovascular and liver health. DRcaps® capsules are resistant to gastric acid and do not require extra ingredient that protect against moisture. This increases the bioavailability of active substances and ensures full intestinal absorption. Vitamin K3 – belongs to water-soluble vitamins. It has been shown to protect mitochondria and helps them produce sufficient amounts of ATP. This allows you to increase your training performance. In addition, this vitamin boosts bone mineral density by stimulating the activity of osteocalcin which facilitates mineral absorption (low vitamin K levels increase the risk of bone fractures). Vitamin K prevents the deposition of calcium in blood vessels which may cause arterial calcification and thus disrupt blood flow. It helps also maintain normal elasticity of arteries and is critical to healthy blood coagulation. What is more, it reduces levels of inflammatory markers, improves insulin sensitivity and is necessary for proper vitamin D metabolism in the body. BERGAVIT® – an extract from bergamota orange fruit (Citrus aurantium bergamia), standardised to contain 25% flavonoids (neoeriocitrin, naringin and neohesperidin). These ingredients are highly effective in lowering blood cholesterol and triglyceride levels, thereby protecting against the accumulation of cholesterol in the arteries. Excess cholesterol in the arteries may lead to the formation of clots and consequently impaired blood flow in the body. These flavonoids stimulate also endothelial nitric oxide production, relaxing the arterial walls and improving circulation. In addition, they may lower blood pressure and have a protective effect on blood vessels. These flavonoids are also said to have great antioxidant potential and be capable of inhibiting the oxidation of low-density lipoproteins. As a consequence, they help sensitise tissues to insulin, thereby unlocking your anabolic potential. Furthermore, they promote body fat reduction and collagen synthesis, boost the body’s immunity and increase bone mineral density. Milk thistle (Silybum marianum) seed extract – milk thistle is a plant of the Asteraceae family which has strong hepatoprotective properties owing to its active constituents. Silymarin, which promotes the synthesis of proteins in hepatocytes and helps regenerate them, is its most potent compound. It has been observed that silymarin may prevent hepatic steatosis and prevent toxins from binding to liver cells, thereby boosting the body’s detoxification. Efficient liver function is necessary for healthy metabolism of hormones and their effective excretion from the body. In addition, milk thistle stimulates the production of glutathione, i.e. a natural antioxidant, reduces inflammation and supports lipid metabolism in the liver. It regulates also blood glucose levels, inihibits fat cell production and promotes mitochondrial function. N-Acetylo-L-Cysteine (NAC) – an acetylated form of the amino acid L-cysteine which supports liver function and protects against free radicals. L-Cysteine contributes to inhibiting glutathione biosynthesis and NAC supplementation effectively boosts its levels in the body. NAC helps also fight against infections and viruses in the bidy, reduces pain and inflammation and may relieve symptoms of acne, which is a common side effect of taking AAS. By enhancing glutathione production, it protects nerve cells against excess glutamate, reduces negative effects of neurodegenerative diseases and improves the function of the intestinal barrier. Coenzyme Q10 (CoQ10) – a chemical compound produced naturally in the body which is the most abundant in the myocardial muscle, skeletal muscles and brain. This compound facilitates, among others, healthy mitochondrial function, is involved in the electron transport chain and ATP production, protects cells from oxidative stress and inhibits lipid oxidation. What is more, it supports blood circulation, improves the functioning of the vascular endothelium and reduces blood platelet aggregation. Coenzyme Q10 promotes the biosynthesis of new mitochondria and stabilises cell membranes. This allows you to increase your aerobic capacity and exercise longer. Alpha lipoic acid (ALA) – a compound found in every cell of the human body which maintains the structure of cell membrane and takes part in mitochondrial energy production. ALA is a potent antioxidant and helps also regenerate other antioxidants – water-soluble vitamin C and fat-soluble vitamin E. In addition, ALA has been shown to improve carbohydrate metabolism and may lower blood sugar levels, exerting insulin-mimetic effects. It may also promote glucose utilisation by skeletal muscles. This boosts their efficiency and reduces muscle damage. Furthermore, it improves liver function and fat metabolism and thus helps regulate the blood’s lipid profile. It has also neuroprotective properties, promotes neuronal regeneration and may protect the brain from neurodegenerative diseases. To sum up, CTD Sports Organ Guard is an advanced dietary supplement designed for individuals taking various anabolic supplements and willing to reduce their negative effects on internal organs. Natural ingredients in highly absorbable DRcaps® capsules promote cardiovascular and liver function. The formulation stimulates also the activity of antioxidants, helps the liver metabolise hormones and promotes the regeneration of organs. Take two capsules a day, along with a meal containing fat. The product may be added to your treatment with anabolic steroids which increase the risk of cardiovascular diseases and have hepatotoxic effects. Individuals taking AAS should consider the risk associated with using such drugs. Liver and kidney damage, increased blood viscosity and elevated blood cholesterol levels may lead to may health problems and, in the worst cases, even death. The supplement will be an effective form of protection while taking anabolic steroids and after discontinuing their use to restore the function of organs. The manufacturer recommends to take two capsules. We suggest to take one capsule in the morning and the second one in the evening. Hypromellose, magnesium stearate, silica, maltodextrin, gellan gum. Health of oral cavity and throat. Counteracting inflammations of gums. Support of the treatment of periodontal disease. The complex of probiotic bacteria and other active substances focused on the support of the urinary system.